Pablo Honey Tapas Bar and Restaurant was a lucky find when we were recently visiting St Kilda to see Blanc de Blanc at the Aurora Spiegeltent. Pablo Honey was directly opposite, just a couple of minutes walk away, and the name sounded interesting... so we decided to try it. In the first greeting, we were told it was happy hour, meaning two for one cocktails and Coronas, and $5 glasses of house wine. Bliss! Walking into the venue, we started to have some appreciation of the origins of the unusual name. 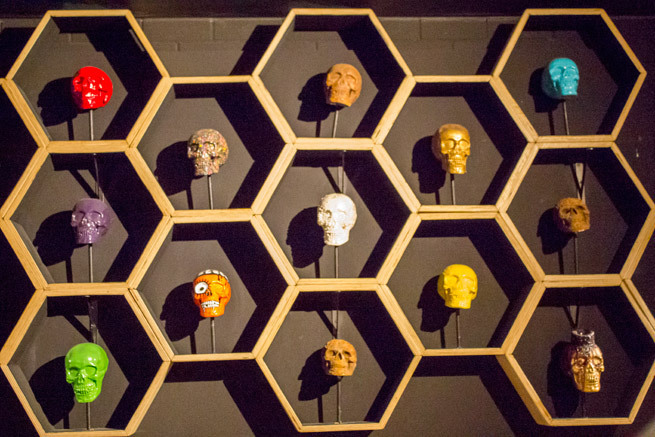 There are large portraits of (former Colombian drug lord) Pablo Escobar on the wall, and room dividers featuring hexagonal shapes - reminiscent of honeycomb. It turns out the artwork is courtesy of Isabella Iskaf, who works at Pablo Honey (as well as running her own art business). On another wall, there is a slightly ghoulish display of skulls. These, we learn, are sugar skulls, such as you might have if you were celebrating Día de Muertos (Day of the Dead) in Mexico. Again, these have been made by a staff member, Jess Carpenter, and can be custom made to order. 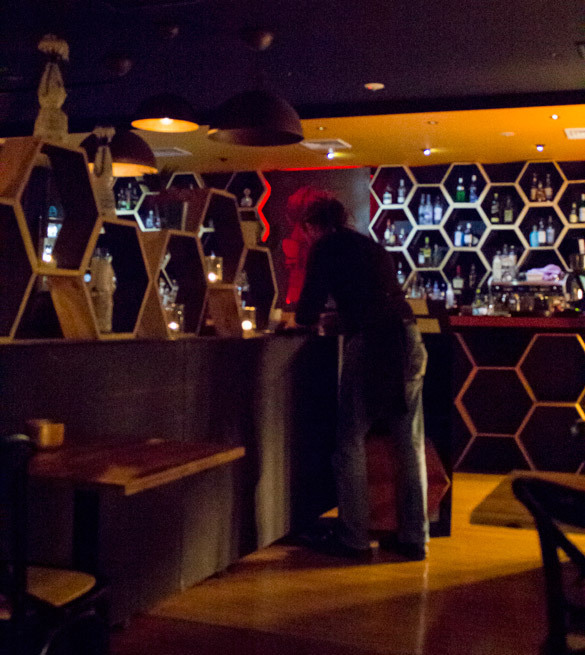 So Pablo Honey is a bit central American, a bit South American, a bit Spanish; overall, the owners aimed to create a venue where tequila happily pairs with tapas, but equally, patrons can get an innovative cocktail and/or a great meal in a friendly environment. But what of the menu? We took one look and went WOW! We knew we had been fortunate enough to find something special. It is one of those menus where we a) were surprised to see certain dishes, and b) struggled to decide what to order, as there were so many tempting options. 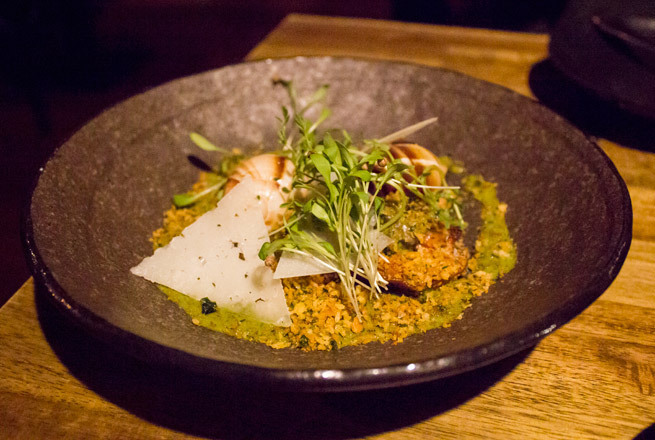 Pablo Honey promotes itself as a tapas bar, and the menu is styled this way - dishes that are suitable to share, with the emphasis on small plates (at value for money prices) and a small number of large plates. After some deliberation, we chose four of the small plates, which for us made a satisfying meal. 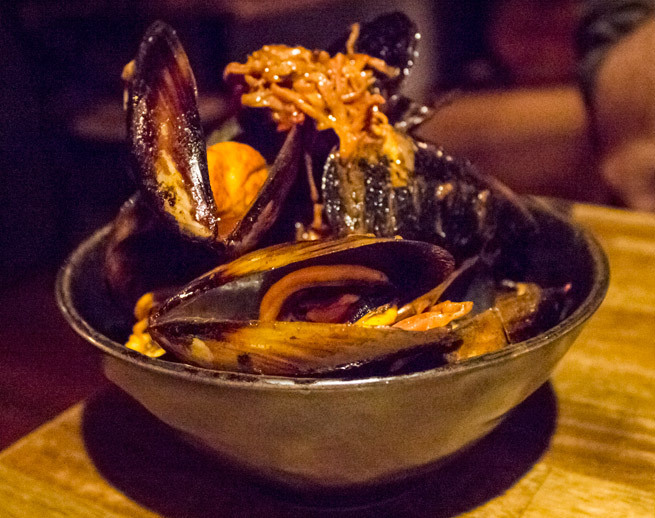 First up was the Spring Bay mussels, with jamon, aji amarillo butter and coriander ($18). This was a big, generous platter of mussels, and the flavours... oh my! 'Best mussels I've ever had', says my partner Dave, and I have to agree with him. The clever chefs got the flavour balance just right. I know we will be going back soon for a repeat on this dish. The chargrilled pine mushrooms, with caracoles (snails), parsley migas fritas ('fried crumb') and manchego ($17) again, was delicious. It was inspired to pair the snails with the mushrooms - a subtle contrast of flavours and textures. Yum. After a short break, our next two dishes were served. The first was pan fried chicken livers, with jamon, onions, sherry and parsley, served with a good chunk of a French stick ($14). Dave is the offal fiend, and he relished this dish. 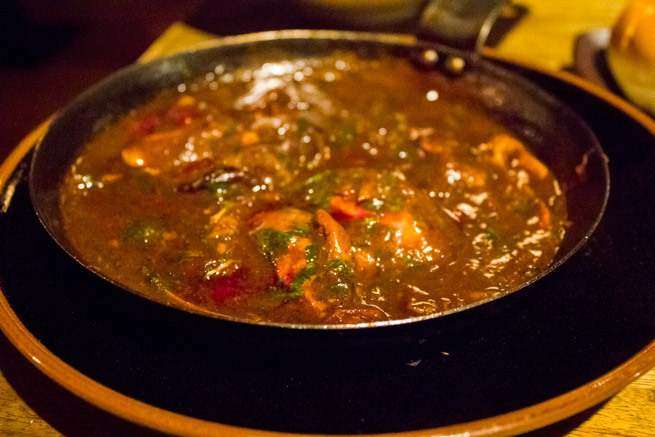 Personally, I'd have been happy just with a dish of the beautiful, rich sauce in which the livers were served. 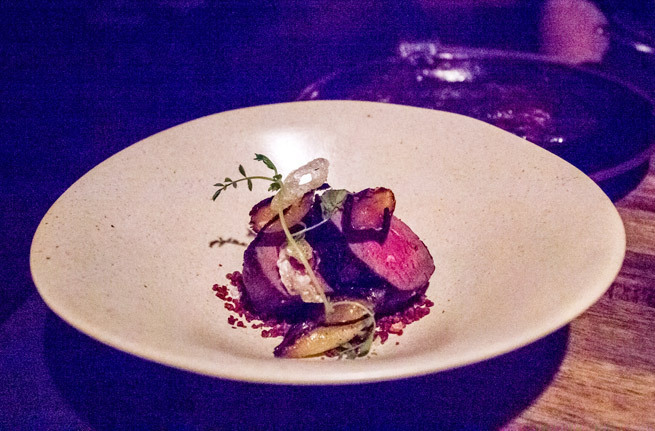 Our final dish was the Wagyu with charred onion, piñon crust and puffed beef tendon ($16). The Wagyu was perfectly cooked - as you can see in the photo, it was gorgeously pink and plump on the plate. A delightful dish. If you want a larger sized dish to share, there are a few options available at $45 each, including chargrilled Mapuche pork Scotch with roasted pear, chilli salsa, tortilla. The desserts, too, sound unusual yet inviting, such as the cacao mousse, with pithaya cactus gel, berries and bitter chocolate ($15). Overall we had a great experience at Pablo Honey. The food was first rate, the service friendly and efficient, and the drinks (especially at happy hour prices) great value. Make sure you schedule a visit! You'll find Pablo Honey at 68 Acland Street, St Kilda. It is open seven days until late. Click here to reserve a table. The images in this article were taken by the writer. They are not to be reproduced in any form without the express permission of Weekend Notes. The muscles and mushroom dishes look gorgeous.